The Greenland ice sheet is melting at an accelerating rate, with both the extent of melting and the length of the melt season growing. Melting in Greenland has implications for sea life, fisheries, and coastal communities worldwide, by contributing to global sea-level rise and adding freshwater to ocean ecosystems. Glaciers can be found on every continent on Earth, but only three massive ice sheets exist in the world today: the Greenland ice sheet, the West Antarctic ice sheet, and the East Antarctic ice sheet. Like glaciers, ice sheets are large masses of slow-moving ice formed from layers of compacted snow. But unlike glaciers, ice sheets are thick enough to cover most of the terrain beneath them, including mountains. The Greenland ice sheet is shrinking.2,3,4,5 Ice sheets grow through snowfall, and shrink through surface melting, water runoff, breakup into the ocean (calving), and direct transformation into water vapor (sublimation). 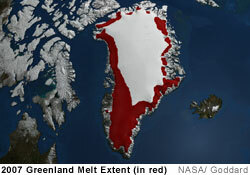 Over the past quarter-century, both the extent of melting and the length of the melt season on the Greenland ice sheet have been growing, as local temperatures have risen.6 Satellites measure the extent of melting by differentiating between areas of the ice mass that are fully frozen and those with surface meltwater. Melting reaches its maximum in late summer. The shrinking of the Greenland ice sheet is a global issue: it is affected by and contributes to climate change, and helps shape fisheries, other sea life, and coastal communities around the world.